I would really like to introduce my readers to Monsignor Florian Kolfhaus who serves at the Secretariat of State’s Section for the Relation with States at the Holy See (Vatican). He has a Ph.D in Dogmatic Theology (my kind of teacher) and a Licentiate in Canon Law . His resume goes on and on, and he fulfils so many diplomatic functions at the Holy See ; it’s truly remarkable. He speaks on the radio regularly in Europe, puts on retreats, and has been seen at Steubenville and on EWTN. However, under all of these very impressive titles, degrees, and important positions, I have found a truly humble servant who loves Our Lord, and has a very special relationship with Our Lady. He has chosen to share some of his beautiful meditations and writings with us right here at Canadian Catechist, and we are very honoured and blessed to be in this position ; thank you so much Monsignor! His very profound way of sharing his beautiful spirituality cannot be hidden under a basket. I knew when he sent me his writings and meditations that they would be really great, but I wasn’t expecting for my soul to be touched in the way it was. I am vey pleased to share this with you ! I suggest you pray before reading the meditation below. You can pray a Hail Mary prayer, the Our Father, Glory be, or the Come Holy Ghost prayer! I just suggest that you pray before reading Holy Scripture or spiritual reading in order to open your heart and mind to the voice of God. Certainly, there are many ways that lead to God. The greatness and goodness of God can be seen in His creation. His mercy shines in the person of Jesus of whom the Gospels speaks. The Lord Himself speaks to us through His word, through His Church, and through our conscience. But man can indeed ignore all of that. On the subject of error and sin, C.S. Lewis writes, “Its victims seem to see it the least, the more they have fallen into it. God whispers to us in our pleasures, speaks in our conscience, but shouts in our pains: it is His megaphone to rouse a deaf world.” Suffering that renders us speechless by its injustice burns everything away that is not God. He who suffers then, when no man can help any longer, can only reach out for God. He who suffers experiences in suffering that he is a creature who has not created himself and cannot redeem himself. Indeed, even rebellion, how a good God can allow such pain, is no longer a philosophical question in the hour of need, but a call for a saving hand, which can pull us from the abyss. They say, “Necessity teaches prayer.” And indeed, God is so humble that He does not reproach us when we go to Him, when no one else can help us anymore, when we see no way out, when He is, so to speak, the last choice and there is no other remaining. Oftentimes, we must pass along the painful road to find God, to discover that all the other ways in life were dead-ends. Demons suffer without loving. Angels love without suffering. We men live in this world to suffer and to love. That is our mission. Of course, suffering can lead us to bitterness; suffering without love is hell – in the truest sense of the word. But to suffer and to love are nevertheless a power which can bring heaven down to earth. Suffering and loving means overcoming evil from within, because an evil – suffering – is turned into good. Suffering and choosing to love is to defeat evil with good, to defeat the devastating power of sin and its consequence of death and pain in the world, and to transform it into grace and blessing. The lover who is stricken by the weight of suffering takes on evil and transforms it. He takes it upon His shoulder and goes forward, always in the grace of Christ. He goes up to Golgotha, transforming the cross from a punishment into a sign of life. The bare wooden beams on which the sentenced person is tortured to death become an altar on which the Lamb is slaughtered and sheds His blood for the salvation of the world. Christ did not die the death of a convicted criminal on Calvary, as it may have seemed, but suffered with a human and divine love to the point of sacrificing His life. He is the Lord who handed Himself over to the enemy in order to make His life a sacrifice and to make the corrupter of mankind – in accordance with the Divine plan – the servant of salvation. Victor quia victima. He is the victor because He became the victim, for “the Lamb is stronger than the dragon” (Pope Benedict XVI, December 22, 2005). The devil’s anger nailed the body of Christ to the Cross and pulled His human soul down to the edge of the abyss, where the Lord, who was close to despair, was not even sure about the closeness of the Father: “My God, My God, why have You forsaken me?” But precisely in this way Jesus has won, and the one who thought to govern Him through pain and fear has lost his battle. In a certain sense, Jesus defeated the devil with his own weapons – or better put – by His love He reversed the blow of the sword and forced the blade into the demon himself. In the deepest moment of His anguish, Jesus loved not only God, but also us sinners – we who do not deserve that kind of love – and He pulled us from the abyss and redeemed us. The fire of His love turned the giving of Himself on the Cross into a sacrifice that reconciled God and men. In this fire, Christ offered His own body and blood to the Father in order to bring about everlasting salvation. In this sacrificial flame that still burns on our altars, His love, which He brought to fulfillment on the Cross, shines forth. We are capable of suffering and loving Christ on earth, and that indeed is the great dignity of the baptized, of which – as some mystics have said – even the spirits in heaven are jealous. We can participate in His sacrifice, as unbelievable as this seems, and add what His suffering lacks in order to complete the power of His grace (cf. Col 1:24). Indeed, He wants us to suffer, to love, and to stand with Him on Golgotha: not as people convicted by an unpleasant fate, but as priests and kings, whose toils and sufferings God accepts as worthy offerings, because they come from people in love. All of this naturally remains a mystery; the more pain and fear darken the eye, the more impenetrable and obscure the mystery seems. To love in these moments – even without feeling it or being aware of one’s own love – disarms evil, which has already become weakened from striking a loving soul. This battle, in which our defeats are turned into victories by grace, can only be fought by the One who has taken all of our life’s burdens upon His shoulders. Only the One who has become a believer in love can be a suffering lover. Everyone who, at the end of the painful road, is asked how he could have climbed this steep path and why he did not remain on the ground after so many falls, since everything seems useless, will answer with St. John: “Credidimus Caritati – we have come to know and to believe the love that God has for us” (1 Jn 4:16). Station: Simon of Cyrene helps Jesus carry His cross. Everything goes black. I stumble and trip. One of the soldiers clutches me and holds me up cursing in order to keep me from falling. It is not pity, no. Even my executioners, who made a game of striking and humiliating me at the Praetorium, want to finish it. I cannot go any further. Only the sheer strength of the Roman, who will not release his grip of my arm, supports me. He holds me like an animal. He spits at me, disgusted by my wounds. If it were his decision, he would exterminate this piece of filth here and now. Why this big scene for a simple Jewish criminal? He yells to his comrades to fetch a man from the crowd to help Me. They bring a stranger to my side under the wooden beam, one who has given up on protesting against it. He does not bow voluntarily under My cross; he curses this day, the Romans, and Me. We are like two oxen yoked under the same plough. I sense his bitterness, his pain, and his anger. It is unjust to make him carry the cross. But is it not the same for Me? He is innocent. Am I not innocent as well? The soldiers push us further. The weight on my neck has become lighter, while it rests heavily on his. Eventually, he will throw down the cross and go his own way; I will be nailed to it. He will live; I will die. I alone hold the whole universe on My shoulders but could not carry this cross alone. I need him. I need you! Who told you that you must do it by yourself? When my strength fades, how could I expect you not to be crushed under the cross’ weight? He accompanies Me for a short while, and with these steps he shares not only My burden, but also My lot. Does he know how much he is helping Me? Does he know how much it means to Me, that he goes along this Way of the Cross? Where are My friends, the ones who should understand what I am doing here and help Me? A stranger comforts Me more than they do, because he is present and shares My pain. He is moved neither by faith nor by piety, for neither love nor pity he is by My side, and yet he helps Me. He helps Me despite being forced. Would you carry My cross if you had not been forced to carry it? Would you be so close if sheer violence had not cast you under the same yoke? Trust Me, I do not want to see you suffer, but still, you ease my burden. You scream, you curse and rebel, that all of this be loaded upon your shoulders, and at the end you are silent, full of defiance and bitterness. But still you have helped Me more than any of My friends. Do you think that you have no other choice? I turn My head and seek a gaze, I seek your gaze. There is only a hand’s length between our faces, shoulder-to-shoulder we carry the same weight. Now you are closer to Me than anyone else. There was only one moment, but he sees and understands. His muscles flex and his step follows My struggling steps. Would we have become friends if it were not for this cross? Suddenly, everything changes: it is no longer the blows of the soldiers that urge him on, but his pity; not violence, but love. You are clinging to my cross. You cannot throw it down, as much as you convulse against it. I plead with you, let it be done to you. I need your help, and I yearn for your love. Despairingly, you ask, “Why me?”, and wish that everything had happened differently. You would not remain a spectator by the wayside like so many, but go with Me. I would not have been able to endure it if you had turned and gone your own way. If I were to tell you that it was election and not damnation, would you believe me in this instant? Believe me, I did not want your pain, but it has to be so, in order for you to be with me. Why do you not turn your head and look at Me? Do you not realize that you are closer to Me than ever before? I know how hard it is. If you could only fathom that you were not a victim of blind fate, but chosen and loved. Trust me: when you are at the end and look back, you will understand it all. More to follow soon ! Please get yourself a copy of this beautiful book at your nearest Catholic Bookstore or right here . I am sure Branches Catholic Bookstore will have these stocked soon! ps It is important that we pray for and support the faithful, solid, and orthodox priests that stand up for our Faith and Church through these crazy times. This is one of the reasons why I am suggesting Monsignor Florian’s books. They are faithful and orthodox. We need to support these priests in any way we can, and one way is to share and purchase their books. The surprising thing to many is that I haven’t had much to say lately. Yes, I have been very busy at finishing my semester at Ryerson University in Toronto this is true. I have also been a busy father to my children, and a husband to my wife. Like many of you I am sure, the recent events in the World, and the Church, have taken a bit of hold on me. It was even suggested to me by a very holy priest that their are times that require silence. This is one of those times. Not silent as in not doing anything, but silent as in prayer and penance. I have been recently reading a book by a Russian Catholic lady named Catherine Doherty called “Welcome Pilgrim”. I haven’t finished it yet so I cannot give a solid recommendation for it, but so far it is wonderfully spiritual and Catholic. I needed something a little lighter to read to help give me a little lift in spirits, so far this book has been the medicine that my soul required. Catherine said that she was taught by her parents from a very young age that one should ALWAYS have two hands lifted to God, one hand with prayer, and the other hand with penance. How beautiful. Talk about keeping it simple and true. Sometimes I could get a little congested with all the doctrinal material that I read and be to concerned about what I know about God. What’s most important is having a relationship with God, knowing God. Yes, of course as a catechist I have to know about God, but I also have to know God as well. It can be a subtle trap set by the devil. I’m much more aware of it now and pray for the proper balance of knowing about God and having an intimate relationship with him. My dear friend and priest Monsignor Florian Kolfhaus from the Vatican always states that “Theology is best learned on ones knees“. This is so true. When praying the Rosary so many of my theological questions have been answered by thoughts and inspirations. I don’t mean that all of a sudden some voice speaks in my ear, but the answer to a question seems to be answered at times. I believe this can happen for anyone who prays the Rosary. You should try it! Back to prayer and penance. For this Advent Season I am going to try and willingly take a posture of prayer and penance with both arms lifted up to God. I ask that my readers please join me in this posture and encourage their friends and family to do the same. Let us praise, reverence, and serve God. We can attend an extra Mass throughout the week, fill the food bins for the needy, say an extra decade of the Rosary, and the list goes on. There are so many Novenas that can be said, just Google Catholic Novenas. Once again, please join me in lifting up our arms to God in this time of Advent in prayer and penance. One more thing before I go. As far as Confession is concerned, why not go every couple of weeks? You don’t have to be in mortal sin to go to Confession, you can go to receive the graces and confess any venial sins. Usually when in the confessional I will ask the priest for forgiveness for the sins that I do not even know that I have committed. It is a good habit to go to Confession a couple of times a month, and so many graces are received from just going. Keep Your Eyes on Jesus Mary and Joseph! Jesus I Trust in Thee ! It is so important for us to understand that God has specifically hand picked us to be here right now to fight in this fight. What fight you might ask? The fight for the salvation of souls! I have been trying to temper my comments and posts about certain problems that are raging inside God’s Holy Church, but I can stay silent no more. It has not been easy to remain silent, but as I continue to watch the evil weave its way to the top of the mortal hierarchy something needs to be said. We must not waver from the TRUTH that has been taught by JESUS for 2,ooo years. Communion for adulterers living in sin can NEVER be allowed. This is the TRUTH period. Is it politically correct? Who cares? This is about souls, not feelings and sentimentality. This is about that really long time called ETERNITY! Catholics please wake up and stand up like the Apostles and Martyrs did and are doing over in the Middle East! We NEED Saints right now! God has chosen us to be potential Saints, what are we waiting for? Let’s call evil what it is when we see it, even if it is coming from the Pope himself. Yes, even if the Pope goes against Jesus and His Church we will have to call it what it is. Let’s pray that Pope Francis doesn’t go against Jesus and His Church. EVERYTHING seems to indicate that the Pope is going to allow adulterers living in sin to receive Our Lord in the Eucharist. Yes, I said it, because this where everything seems to be pointing. I HOPE that I am wrong, I really do, but we must prepare for this now. How do we prepare? By continually learning Our Faith from Holy Scripture and the Tradition of the Church. Pope St Pius X pray for us! It is important for people, especially the faithful, to realize that it is only under the strictest conditions that the Pope can actually speak infallibly, and that Pope Francis HAS NOT spoken infallibly on any issues and probably won’t. This does not mean that we should not listen to him, because we should. We should try and listen with an obedient disposition, but also realize because he speaks so often and off the cuff that he may err at times. This is why the press office of the Vatican has so often had to give clarifications. It is also very important to understand that Bishops can and will make statements and possibly even teach heresy. We have seen this lately, especially in Germany! The faithful are NOT bound to follow ANY teaching that is contrary to an already established Dogma of the Faith. In fact, it would be a sin against Faith were the faithful to follow a new teaching that they knew was erroneous. As Catholics we have a responsibility to do our homework and find out what the Church actually teaches ; claiming ignorance is not really an option. I’m going to get straight to the point. Dogma CANNOT change. All of this synod hoo-haa can do nothing to change what GOD HAS ALREADY REVEALED! God is immutable, He cannot change, and neither can the Truth become something contrary to what it is. Here is an example : someone wants you to believe that a chair is actually a chandelier, and that person has convinced many people in the room with fancy words and tricky philosophies that the chair has somehow evolved into a chandelier. But you know that chandeliers hang from the ceiling and give off light, and you still see people sitting their bottoms on chairs, not chandeliers. This doesn’t mean that the chair is a chandelier. The chair is still a chair even if everyone in the room is now saying that the chair is a chandelier. The Truth is the Truth! So here goes, I’m going to type it now! Even if the Pope were to try and change the teaching, it wouldn’t, and couldn’t be changed ! There, I said it. The Pope is supposed to be a guardian and protector of the Faith, that is it! If the Pope teaches something contrary to the “constant and very firm” teaching of Jesus Christ through His Church, then we CANNOT follow that teaching, WE MUST STAY FAITHFUL TO CHRIST! We need to pray for the Pope and the Bishops, especially the Bishops that are spewing heresy ; they NEED our prayers! No, the Church is not infallible because the Pope is infallible. It’s the other way around. One of the more upsetting results of this Synodal chaos is the division it is creating between believing and sincere Catholics. Sadly, one of the more dire results of the last 50 years of non-catechesis has been a grave defect in the knowledge of most of the faithful on the limits and nature of papal infallibility. Crash Course in the Church’s Infallibility. The Church is not infallible because the Pope is infallible. The pope is infallible because the Church is infallible. Jesus the Divine Teacher continues to teach in this world the “message of truth”, which he originally gave to the Apostles and through them to the world. This is the Deposit of Faith and Morals. It contains primarily supernatural knowledge about God and how to get to Heaven to see and rejoice in the Father and the Son and the Holy Spirit forever. This revealed treasure also contains a crystal-clear reaffirmation of the Natural Law of right and wrong, “the observance of which is also necessary for eternal salvation”(Humane vitae). If I turn my back on God the Creator I can’t get to Heaven. In her constant and very firm teaching the Church is protected by Christ. She will not betray Him or His teaching. She is infallible. 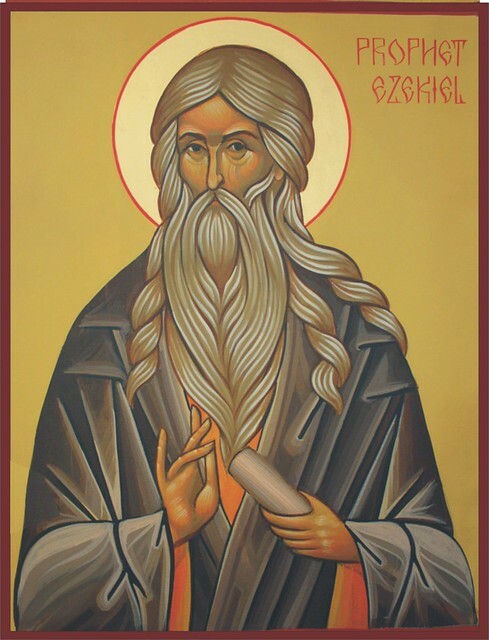 When the Successor of Peter, teaching on a matter of Faith and Morals, AS Successor of Peter , binds the universal Church to believe or to absolutely and “definitively ” hold a particular truth, he shares in the infallibility of the Church. We are only required to believe that the Pope is infallible when all the above conditions are fulfilled. 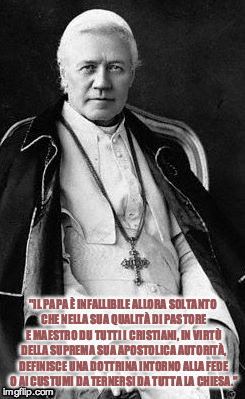 We are very safe in following the teaching of Pope Saint Pius X, in his Catechismo maggiore, that the pope is infallible “only” (soltanto) under those conditions. 199. Quando è il Papa infallibile?Il Papa è infallibile allora soltanto che nella sua qualità di Pastore e Maestro du tutti i cristiani, in virtù della suprema sua apostolica autorità, definisce una dottrina intorno alla fede o ai custumi da ternersi da tutta la Chiesa. “soltanto” = “only,” as in, “at no other time or in no other way”. This means it is impossible for the pope to *bindingly* contradict the constant and very firm teaching of the Church. But by ambiguity, implication, association, action, or in other ways, the pope can sow doubt. As unfortunately we have been seeing these days.